While Hillary Clinton was secretary of state, U.S. officials included a question measuring Bill Clinton's popularity in Haiti in an ongoing poll of the country’s citizens, and the State Department shared the results privately with the former president, internal government emails show. The U.S. government started polling Haitians in 2007, under President George W. Bush. The 68-page survey conducted in 2010 for the U.S. Agency for International Development (USAID), which works closely with the State Department, measured how Haitians felt about public safety, politics, Haitian leadership, the U.S. and its relief efforts in Haiti after a devastating earthquake there killed more than 200,000 people and leveled much of the capital, Port-au-Prince. The resulting report was forwarded by Mills to a top aide to Bill Clinton. Her email was obtained by the conservative group Citizens United in a Freedom of Information lawsuit and shared with ABC News. Citizens United's president, David Bossie, is on leave from the group to work for Donald Trump’s campaign. The question measuring Bill Clinton’s popularity appears to have been added to the poll in June 2009, a month after he was named the United Nations’ special envoy there and six months after Hillary Clinton was confirmed as secretary of state. At the time, the former president’s energies were deeply invested in Haiti, through his work with the Clinton Foundation, the U.N. and the Clinton-Bush Haiti Fund and as a partner to the Haitian president in doling out the billions of dollars in relief donations that poured in. Bill Clinton was the only American rated for popularity in the 2010 poll. It concluded that his image was improving among Haitians. The State Department would not say how much the agency paid for the polling in Haiti. The polling firm, Greenberg Quinlan Rosner Research, was paid nearly $4 million for political polling in the 2014 campaign cycle, almost entirely by Democrats, according to the Center for Responsive Politics. Stan Greenberg, the research firm's chairman and CEO, served as Clinton’s pollster during his 1992 run for president. The State Department would not provide any prior or subsequent polls. 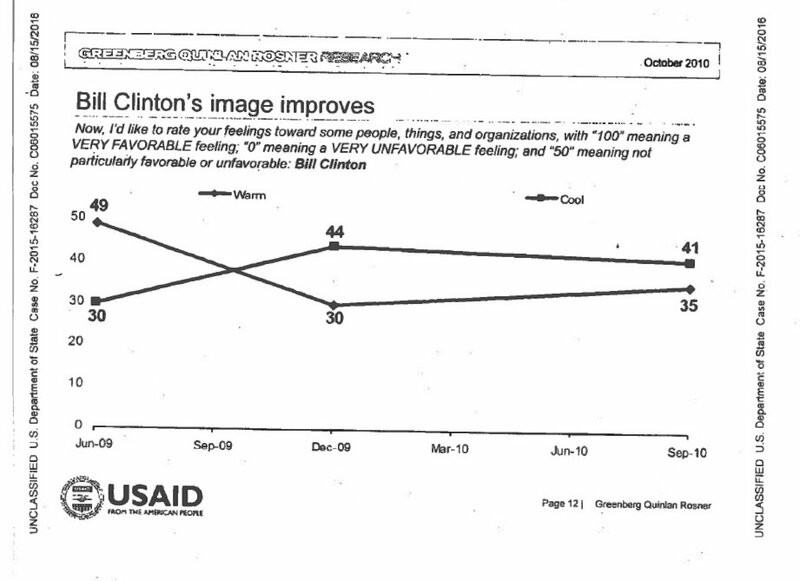 The 2010 survey indicated Bill Clinton’s popularity was on the rise. But there are signs on the ground now in Haiti that his reputation has suffered as severe housing, job and health crises persist there. Denis O’Brien, a telecom billionaire who runs one of the largest companies in Haiti and is a close friend of the Clintons, said the former president has poured his soul into the recovery. O’Brien believes history will judge Bill Clinton kindly for his efforts in Haiti.